As penalties go for Penn State, death would've been preferable. The NCAA hammered the Nittany Lions football program Monday for its role in concealing Jerry Sandusky's sexual molestation acts, leveling coach Joe Paterno's once revered team with stiff penalties and unprecedented fines that will hurt in ways that suspending play for a season or two might not have. • A $60 million fine, with the money going to an endowment to benefit the welfare of children. • A four-year ban on postseason play, including the Big Ten championship game, bowls or the playoffs coming in 2014. • A reduction in the maximum allowance of scholarships offered to incoming players from 25 to 15 a year for the next four years. • Any entering or returning player is free to transfer without restriction (such as sitting out one season). Others can maintain their scholarship at Penn State and choose not to play. • The vacating of all victories from 1998-2011, which strips Paterno of his title as the winningest coach in college football history (now Grambling's Eddie Robinson) and Division I-A (now Bobby Bowden). Paterno, for the record, loses 111 wins and now ranks 12th with 298. There’s more, such as a five-year probationary period and the hiring of an academic monitor of the NCAA's choosing and so forth. Penn State will not appeal the sanctions. School president Rodney Erickson signed a consent agreement with the NCAA and "accepts the penalties." "[The penalties] reflect the magnitude of these terrible acts but also assures Penn state will rebuild an athletic culture that went horribly awry," NCAA president Mark Emmert said at a press conference in Indianapolis. "Football will never be put ahead of educating, protecting and nurturing young people." For first-year Penn State coach Bill O'Brien, dealing with a one-season suspension of the program would have been easier to handle. The death penalty is a misnomer because in NCAA terms there is always life after death. It's just the suspension of play for a year or two. As painful as a silent season in State College would've been, O'Brien, the freshly hired 45-year-old, could have spent the fall recruiting and pointing to the future. Instead he deals with mountainous hurdles in an attempt to win. Emmert was clear he wanted a culture change at Penn State and nothing changes the culture like 5-7 seasons. Football stops being so important. Penn State and its fans always said the program was about more than winning. The next decade will offer them a chance to prove it. Only one program has been handed the death penalty, SMU in the 1980s. The reason it's struggled to find success since then, however, isn't because of that penalty. It's because the school de-emphasized football. The NCAA banned the Mustangs from one season of play. The school added an additional year. Then it applied strict academic requirements to recruits that completely altered the type of athlete it was bringing in. It never got caught up with the competition in terms of building opulent facilities or a massive stadium, items the Nittany Lions already have. Penn State had a failed culture of leadership, where, as Emmert noted, the program was believed to be "too big to fail, indeed, too big to even challenge." In terms of the program, however, this was still a well-run operation. No player was ever involved in this scandal. It could've been abolished for a year, continued mostly business as usual and been back long before these recruiting sanctions will endure. It's nearly impossible to recruit a great or even good player when he knows he can't participate in the postseason until he is, at best, a senior. Any player worth his scholarship wants to compete for championships. Penn State players can't. So why wouldn't recruits just go to Michigan or Alabama or wherever? The cuts in available scholarships not only limit O'Brien's ability to bring in top-flight talent, it will create significant depth problems for years. It won't be until the 2020 season that Penn State would have a full complement of scholarships across all four of its classes. In the interim, O'Brien has to convince great players to compete under those circumstances. Although USC's recruiting success of late under similar restrictions shows it is possible, within minutes of Penn State's sanctions being handed down, elite recruit Ross Douglas, a cornerback out of Ohio, reportedly rescinded his commitment. You have to wonder if O'Brien, the former New England Patriots offensive coordinator with a bright future, even sticks around after this season. Penn State is now a pile of rubble, facing an uncertain future. That reality is part of the legacy of Paterno, who built the program to stratospheric heights only to leave it an unmitigated disaster. The stripping of his victories were a direct attack on JoePa. 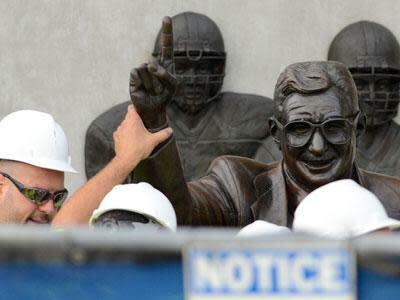 He officially lost 111 victories one day after his statue was removed outside Beaver Stadium. He is no longer the winningest coach in college football history. To gauge the NCAA's anger, consider the decision to vacate games back to the 1998 season. That was a year that Sandusky, then the defensive coordinator, was first accused of molesting a boy in a locker room shower. Local police investigated and the district attorney declined to prosecute. Sandusky was essentially cleared of wrongdoing. Yet Paterno is punished for a police investigation that didn't yield charges? In fairness to Paterno, what was he supposed to do at that moment? How do you fire an assistant coach who, at that point, was seemingly wrongly accused? To cite Paterno for his failure in 2001, when a second allegation surfaced is one thing. To wipe away wins all the way back to 1998 is another. That's evidence of the NCAA's determination to harshly punish the once iconic coach. This was clearly a vengeful, hard line NCAA on display Monday. It's a reversal from so many soft penalties and bizarre rulings. Instead, it delivered a cannonball to the chest of Penn State that both strips the program of parts of its past and complicates its future. Of course, there will still be games. There will still be players receiving educations. There will still be teamwork and hard work. There will still be tailgates and beautiful fall days in Happy Valley and the band playing the fight song. That much remains and that is worth remembering. Losing a few more football games than you are accustomed to isn't, in the grand scheme of things, an insurmountable penalty. On this day for Penn State and its football fans, it just seems that way. It just seems worse than death.